The blood vessels in your nasal cavity may burst due to many different reasons, causing a nosebleed. 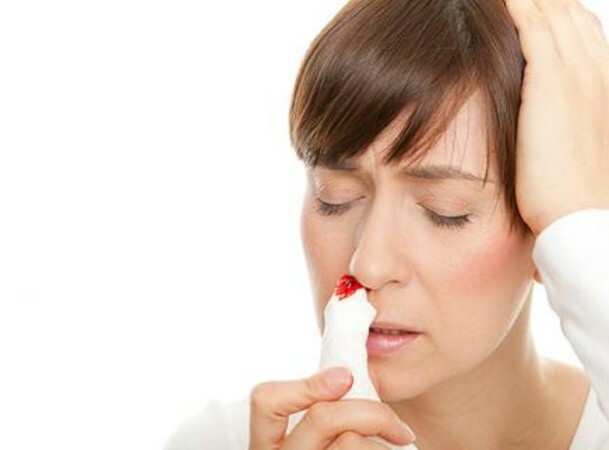 Medically referred to as epistaxis, nosebleeds are quite common mainly because there are many vessels in the nose. Most people end up dealing with a nosebleed as a result of nose picking. Drying of the nasal membranes is another common cause of nosebleeds. This condition can be prevented with proper lubrication of the nasal passages. Besides, there are a number of other simple remedies you can try at home. Keep your head elevated with a couple of pillows while sleeping. Include more vitamin C and bioflavonoid in your diet to help strengthen your blood capillaries. The stronger they are, the lower the chances of them to burst easily. You can eat more of citrus fruits and bell peppers, watermelon, apples, onions, and garlic to get the all-important nutrition. Aim for about 500mg of bioflavonoid twice a day to see results. Do not eat foods that are likely to cause allergic reactions, such as wheat or milk, and stay away from allergens. Do not eat too much fried or spicy food. Drinking nettles leaf tea is another way to learn how to prevent nosebleeds. Simply drinking half cup of tea twice a day will help stop nosebleed and prevent it from happening again. This tea is also great for treating allergies. Avoid smoking because it slows healing and dries up your nose. Avoid illegal drugs such as amphetamines or cocaine. Avoid excessive use of non-steroidal anti-inflammatory drugs and aspirin. Always use prescription blood thinners such as warfarin, enoxaparin, etc., as per your doctor's instructions. Avoid using non-prescription decongestants, antihistamines, or medicated nasal sprays because overuse will lead to a dry nasal cavity and cause nosebleeds. Putting a few drops of vitamin E, castor oil, or zinc oxide in your nose may help prevent nosebleeds. You can also try using nasya oil to learn how to prevent nosebleedsat home. The oil is quite beneficial for chronic congestion and dry sinuses. Apply a couple of drops of warm nasya oil in the nose and massage your nose gently from the outside. Ensure that the oil finds it way inside the sinus passage. This will help keep the nasal passage from drying. You can also use nasya oil in the morning, immediately after a nasal rinse. Make use of saline sprays or nose drops to prevent nosebleeds. You can also use water or saline-based nasal gel to lubricate the inside of your nose. Do not blow your nose forcefully, and avoid picking to remove crusts. Avoid scratching your nose hard, especially when it is dry. Install a humidifier to add some moisture in the air of your room. Regulate temperature in sleeping areas and keep it between 60°F (16°C) to 64°F (18°C) because cooler air wont’ dry out your nasal passages. Inhale steam or breathe in moist air. You can sit in a shower for some time to inhale steam and then apply a layer of nasal gel afterwards to keep your nose from bleeding. Pay special attention to trimming your child's fingernails because they can cause an injury and leads to nose bleeding. Ask your child not to pick their noses. Tell your children to never put anything in their noses while playing. Include food rich in vitamin K in your kid’s diet because it encourages proper blood clotting. You can provide your child with more vitamin K by giving them homemade sauerkraut and grass-fed animal fats, such as raw dairy butter, homemade lard, and raw cheese. Dark leafy veggies are also a rich source of vitamin K, so are cereal grasses like wheat, barley, and oat grass. There are certain homecare measures you can take to learn how to prevent nosebleeds,but what if your nose has already started bleeding? You can take the following measures if you are dealing with the problem of nosebleeds. Remember, if your bleeding is severe, it is always a good idea to see a healthcare professional. Use your index finger and thumb to gently pinch all the soft parts of your nose together. Now, press it firmly toward your face while making sure the pinched parts are against the bones of your face. Lean forward with your head tilted forward. It is important to be in this position to ensure the blood does not run back into your throat or sinuses, otherwise it may cause gagging. Hold your nose in this position for 5 minutes or so. Repeat it again until the bleeding stops. After stopped the bleeding, you should sit quietly for some time and ensure that your head stays higher than the level of your heart. Do not try to put your head between your legs. You may also use ice pack on your cheeks and nose to relief any type of swelling and pain.